There is the law of non-contradiction. This law states that a proposition and its negation cannot both be true at the same time and in the same sense. A negation is the opposite of the original proposition. It is formed by adding “It is not the case that” in front of the original proposition. So, if the proposition is “The sky is blue,” then the negation would be “It is not the case that the sky is blue.” If we label a proposition as p, then its negation would be labeled “not-p.” The law of non-contradiction requires that one of the two propositions must be false. So, if I said, “The Sky is blue, and it is not the case that the sky is blue,” my statement would be false according to the law of non-contradiction. Another way to state the law of non-contradiction is that the combined proposition, p and not-p, is always false. We also have the law of the excluded middle. This law is similar but distinct from the law of non-contradiction. It states that either a proposition is true, or its negation is true. So, if we have a proposition – let’s call it p, and if that proposition is false, then the proposition not-p would have to be true. Conversely, if p is true, then not-p is false. A proposition always has the opposite truth value of its negation. Another way to state the law of the excluded middle is that the combined proposition, p or not-p, is always true. There are many other laws of logic, such as modus ponens and modus tollens. But the above three laws of logic are often considered the most basic. They are sometimes called the “three laws of thought.” Many other laws of logic follow from these three. But what is the nature of a law of logic? Can you see one with your eyes? Can you accidentally swallow a law of logic? Of course not. Laws of logic are abstract and conceptual. They do exist of course, otherwise we could not use them. But they are not physical. They are not made of atoms and therefore you cannot see, taste, or touch a law of logic. We can write a law of logic on paper, but this really is merely a representation of the law – not the abstract law itself. After all, if we then erased the sentence, the law of logic would not cease to exist. Laws of logic are universal, invariant, abstract rules of thought that govern all correct reasoning. Let’s examine each of these adjectives one by one. First, laws of logic are universal – meaning they apply everywhere in the universe. The law of the excluded middle works just as well on Earth as it does in the Andromeda Galaxy. When the astronauts landed on the moon, did they have any doubt that laws of logic would work there? Did they say, “I sure hope the law of non-contradiction works on the moon!”? It is unlikely that this even crossed their mind for a moment. No one really doubts that laws of logic apply equally well everywhere in the universe. Second, laws of logic are invariant, which means they do not change over time. Many things do change over time. People age, canyons erode, stars explode, but laws of logic do not change over time. They are exactly the same on Friday as on Monday. No one seriously believes otherwise. Did you wake up this morning thinking, “I sure hope the laws of logic will work today!”? We all presume they will work at all times in the future just as they have at all times in the past. Third, laws of logic are abstract – meaning they exist in the mind. An abstract principle is one that exists in the mind, but which has no physical substance. You can think a law of logic, but you cannot touch one. They exist in your mind, and in the minds of others, and ultimately in the mind of God. As abstract rules, they are not made of atoms, and do not have any particular location in space. So, you cannot accidentally stub your toe on a law of logic, or swallow one. 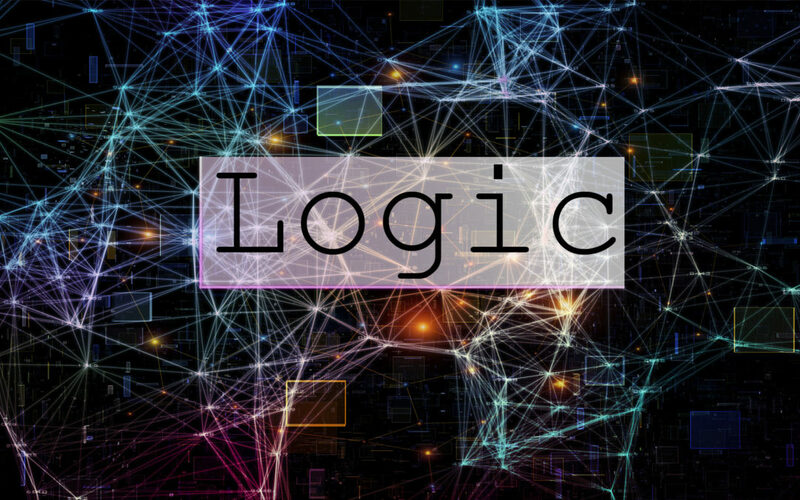 In the Christian worldview, laws of logic are justified; that means we have a good reason or reasons to believe in them and we know they have the characteristics that they have. We can make sense of laws of logic and their properties. Laws of logic are the standard of correct reasoning. And in the Christian worldview, we have an absolute, objective standard for correct reasoning: God. Laws of logic reflect the way God thinks and are rooted in His nature. We can have non-physical things that do exist like laws of logic in the Christian worldview. After all, God Himself is non-physical, and yet He exists. God is not made of atoms, and does not have one specific location in space, yet He is real. Likewise, laws of logic are non-material, but they do exist. We have the ability to use laws of logic because we are made in the image of God (Genesis 1:27). Our mind has a finite capacity to reflect God’s thoughts, as described in the laws of logic. God has revealed some of His thoughts to us. Therefore, we can know about laws of logic. Secular thinkers cannot make sense of laws of logic. Many secularists hold to the belief of materialism. This is the belief that everything that exists is physical – like matter and energy. But laws of logic are not physical. They have no material substance, and no particular location in space. They cannot exist in a materialistic universe. Yet materialists continue to use laws of logic, despite the fact that they cannot make sense of them. Their thinking is contradictory, and therefore cannot be consistently true. This glaring inconsistency is typical of those who reject the Bible. But the Christian worldview can make sense of laws of logic. More than that, the Christian worldview can make sense of their properties: the fact that laws of logic are universal, invariant, and abstract. For example, laws of logic are universal because God’s mind is sovereign over the entire universe. God is omni-present: meaning His power is immediately available everywhere. Indeed, God’s mind controls every atom, electron, and quark in the universe. And laws of logic reflect God’s thinking. So, of course laws of logic will work everywhere in the universe. Laws of logic do not change with time (they are invariant) because God does not change (Malachi 3:6, James 1:17). His thinking remains consistent at all times, therefore the laws of logic that reflect God’s thinking will remain consistent over time. The Christian can know with absolute certainty that laws of logic will work tomorrow just as they have today because God does not change. After all, God is beyond time, so of course He will not change. Laws of logic are abstract because they reflect God’s thinking, and all thinking is abstract by definition. Something is abstract if it occurs in the mind. Laws of logic occur in the mind of God, and in the mind of humans when we are thinking properly. Not only does the Christian worldview account for the laws of logic and their properties, but we can see how each of the three fundamental laws of thought is rooted in the nature of God. Consider the law of non-contradiction. Why is it that a proposition and its negation cannot both be true at the same time? It is because all truth is in God (Colossians 2:3, John 14:6), and God cannot deny Himself (2 Timothy 2:13). Hence, truth will never contradict truth. It would be dishonest to say both “yes” and “no” at the same time about the same thing because this would be unfaithful to the nature of God and would therefore be false (2 Corinthians 1:18). Likewise, the law of identity is rooted in the character of God. God says, “I am who I am” (Exodus 3:14). God is Himself, and He is truth. Consequently, truth is itself. Thus, for all truth statements p, if p is true then p is true. The law of the excluded middle is also rooted in the nature of God. God is truth, and that which is not of God is not true (John 14:6). Any given proposition will therefore either be in line with God’s thinking and thus true, or not aligned with God’s thinking and therefore false. Specific instances of the law of the excluded middle are found throughout Scripture. In Exodus 16:4 The Lord promises to send bread from heaven, and to test whether the people (1) will obey God, or (2) will not obey God. The Lord’s test indicates that no middle position is possible. Either a person will obey, or it is not the case that the person will obey. In Matthew 5:37 Jesus said, “But let your statement be, ‘Yes, yes’ or ‘No, no’; anything beyond these is of evil.” The context here concerns oaths; Jesus instructs his followers not to make oaths that they do not intend to follow. It would be better to make no oath at all. If you say you are going to do something, just do it, otherwise don’t say you are going to do it. The basis for this it that you are either going to do the thing, or you are not – that’s the law of the excluded middle. Christ instructs us to be truthful about our intentions – “yes” we will do something or “no” we will not, since (by the law of the excluded middle) these are the only two possibilities. Anything else is evil because it is not true and therefore contrary to the nature of God. All people know something about the laws of logic. Even those who have never formally studied these laws and cannot recite them nonetheless use these laws in their thinking. The Christian worldview can make sense of the existence and properties of laws of logic, as well as our ability to know and use them. But no other worldview can justify them. A person might assert that laws of logic just “are” and have the properties that they have (universal, invariant, abstract). But apart from the Bible, one can never account for how a human being can possibly know these things. How can a person know that something is universal when no one has universal experience? How can a person know that laws of logic are invariant when we have not experienced the future? Only God can know such things on His own authority, and it is only by revelation from God that we can know these things. And this is exactly what the Christian worldview provides: revelation from God that makes knowledge possible. Truly, the fear of the Lord is beginning of knowledge (Proverbs 1:7).